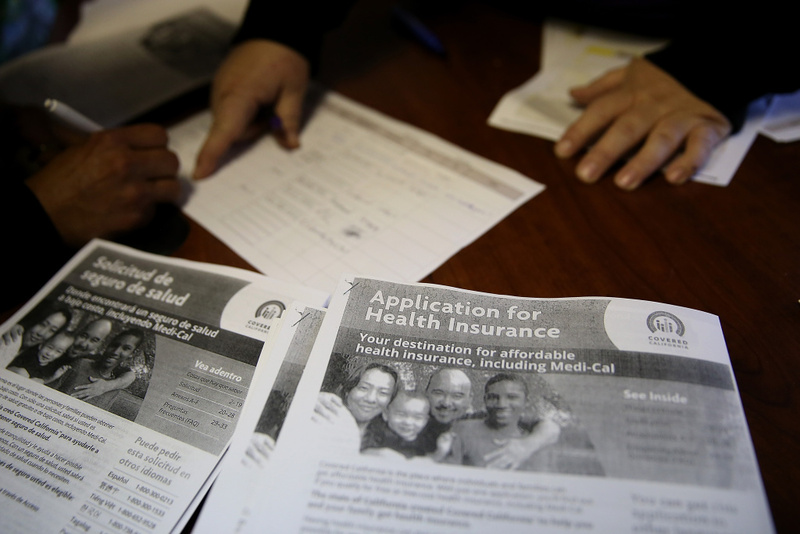 Informational pamphlets are displayed during a healthcare enrollment fair at the Bay Area Rescue Mission on March 31, 2014 in Richmond, California. SEIU-United Healthcare Workers West (SEIU-UHW) held the fair to help people sign up for free and low-cost health coverage through Medi-Cal or Covered California. Covered California executive director Peter Lee pointed toward the nullification of the Affordable Care Act’s individual mandate as the main reason for the drop, saying in a statement “recent actions at the federal level appear to be causing large drops in enrollment that will lead to more uninsured and higher premiums for all Californians.” California Governor Gavin Newsom has, in his first month in office, already proposed a state individual mandate that would require Californians to purchase coverage. What do you think are the reasons behind the drop in new enrollees? How much of a factor is the removal of the individual mandate at the federal level? What could be done to encourage more Californians who don’t get coverage through their employer to enroll in Covered CA?